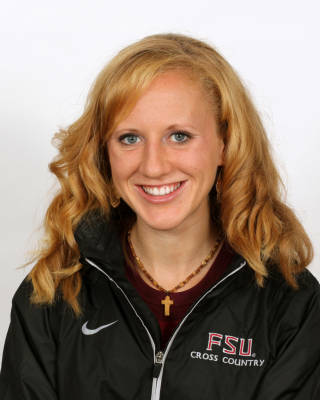 2013: East Prelim quilifer at 10,000 meters on strength of 34:17.53 at ACC Outdoor Championships, where she placed third…has registered 2013 PRs in the 1500, 3000 and 5000… qualified for 2012 NCAA Outdoor Championships in 5000…placed second in 5000 and fifth in 3000 at ACC Outdoor Championships…earned All-ACC and All-South Region honors in cross country for the champion ‘Noles. Enters her first outdoor season with the Seminoles on the heels of productive cross country and indoor campaigns… arrived in Tallahassee in the fall as a junior transfer from Caly Poly where she was a standout in both cross country and track in the Big West Conference…established new PR’s indoors in the mile (4:49.01), 3000m (9:33.10) and 5000m (16:26.69). Enjoyed two outstanding seasons at Cal Poly where she was Big West Freshman of the Year during the 2009 cross country season, finishing second at the conference cross country championship…finished fourth as a sophomore at Big West Cross Country Championships…was 1500m runner-up at the 2010 at the 2010 Big West Conference Outdoor Track Championship in a personal-best 4:30.31…starred at Crater High School winning a pair of Oregon 5A state titles in cross country and the 1500 and 3000 outdoor track titles as a senior…outstanding student who is majoring in psychology at FSU…born June 27, 1991.